Resolves an issue where the system may freeze periodically (approximately 25 days). This system freeze may cause an incorrect display (Clock stall, Black out) and key operations may not be accepted. Resolves an issue where the Clock Display Mode may change to Big Clock if the alarm is allowed to sound until it automatically stops (one hour from the alarm start time). Resolves an issue where the Display Brightness may change to High when the AC power is turned OFF and then ON. Resolves an issue where the alarm may not sound at the time set under certain circumstances. 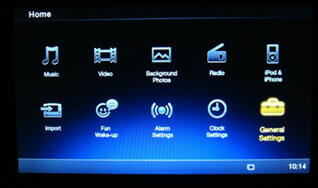 Resolves an issue where the AM radio does not tune properly when setting the AM radio as the Alarm Sound for Alarm B. Resolves an issue where the Alarm Date setting may incorrectly show Weekend when Weekday is selected, or Weekday when Weekend is selected. Note: This issue occurs only when Spanish is the selected language. Resolves an issue where the ICF-CL75iP may freeze or stop responding. Adds the function to allow you to select whether or not pre-installed background photos (wallpaper) should be included in the slideshow. The date format is changed from Year-Month-Day to Month-Day-Year. Resolves an issue where a buzzer may sound instead of music, and an error message may be displayed, when an iPod® or iPhone® is connected while the ICF-CL75iP is in sleep mode. With the ICF-CL75iP powered on, press the "HOME" button. At the "HOME" screen, use the Control Button to select "General Settings", and then press the "ENTER" button. Select "Unit information" and then press the "ENTER" button. If the "S/W Version" is 1.10 or higher, the ICF-CL75iP does not need this update. A 64 MB or greater SD memory card is required to install this update. Note: USB memory devices, MultiMediaCard (MMC), and Memory Stick® media cannot be used. 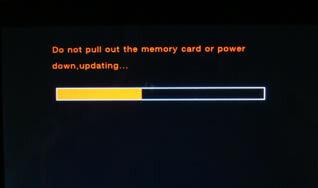 The computer must have an SD memory card slot or compatible memory card reader to copy the update files to a 64 MB or greater SD memory card. Note: If you do not have an SD memory card slot or compatible memory card reader, Sony will send you a free self-service software update. Please call Sony support at 1-239-768-7669 for further assistance. Download the ICF_CL75IP_V110_U.zip file to a temporary or download directory (please note this directory for reference). Note: There are 20 files in the folder "ICF_CL75IP_V110_U". Go to the directory where the file was downloaded and right-click the ICF_CL75IP_V110_U.zip file, and then click "Extract All. The update files will be extracted to a new folder called "ICF_CL75IP_V110_U". Go to the location where the file was downloaded and double-click the ICF_CL75IP_V110_U.zip file. Format a 64 MB or larger SD™ memory card. WARNING!! All files and data on the SD memory card will be erased. Note: These steps may vary by version of the operating system. Insert the SD memory card in the memory card slot. In the "FORMAT device name (drive letter)" window, under "File system," click the drop-down arrow and select FAT32 and then click the Start button. Click to select the SD memory card in the left panel. Copy the 20 files from the "ICF_CL75IP_V110_U" folder to the SD memory card. Note: Do not copy the folder to the SD memory card. Only copy the files in the folder. Unplug the ICF-CL75iP power cord from the AC outlet. Insert the SD memory card firmly into the slot on the back of the ICF-CL75iP. Plug the ICF-CL75iP power cord into the AC outlet. 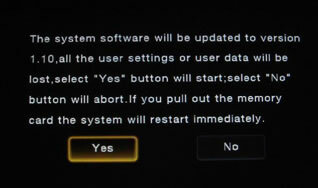 When the system software update confirmation screen appears, use the Preset + and - buttons on the Control Button to select "Yes" and then press the "ENTER" button to start the software update. WARNING!! Do not unplug the ICF-CL75iP or remove the SD memory card while the update is in progress. After about one minute the update is complete and the following screen is displayed. 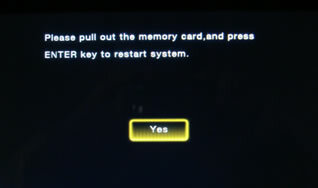 Remove the SD memory card and then press the "ENTER" button. Note: The unit automatically restarts. If the "S/W Version" is 1.10, the software update was successfully installed.